Update: Giveaway now closed. A huge thank you for all contributions. The winners are posted below – if you are one you should have received an email. 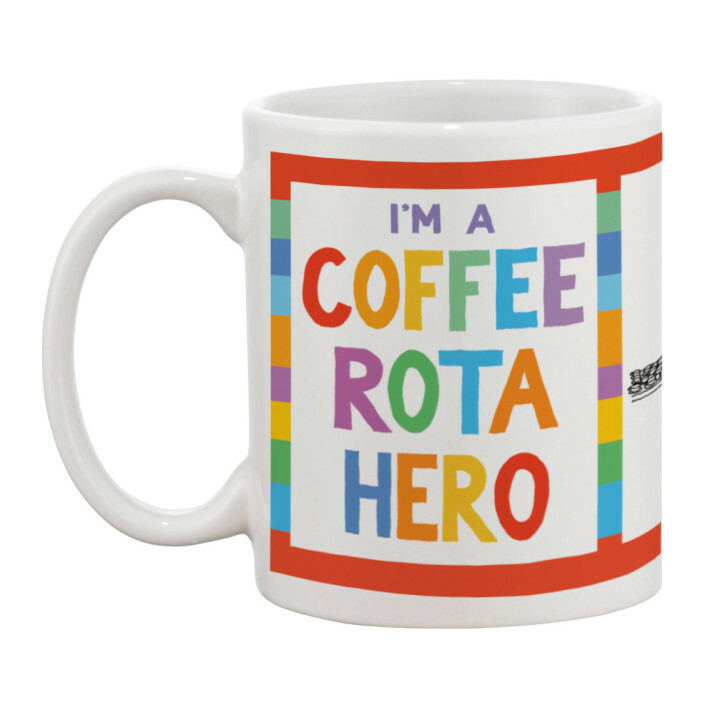 It is January, which is when I traditionally post a desperate plea for cartoon ideas heavily disguised as a cartoon-merchandise giveaway. 10 (ten) prizes of a cartoon book, or a no-longer-available-to-buy cycling cartoon tea towel (slight second). Winners will have the choice of prizes from a list that I will send them. I’d be very happy to sign or dedicate the books. I’ll send the prizes anywhere in the world. Plus… I may add a mystery prize or two, depending on how the mood takes me. Post one or more cartoon ideas in the comments below. (The comment must be on this site, not on social media). Ideas can be a topic you’d like me to cover, or something more finished with descriptions of pictures, etc. It can be a church-themed cartoon idea, or something else entirely. Ideas don’t have to be any good. 2. Entires must be made here and not on Facebook/Twitter. Reason: I use a random number generator to choose the winners, and that really only works if all answers are in the same place and not scattered here/there/everywhere. It is also difficult to print tweets out for reference. 3. One entry per person will count towards the prize. But you’re welcome to send as many ideas as you’d like. 4. Prize-winners will be chosen at random from all entries given. I will contact you to ask for a postal address, so make sure the email address you use (kept hidden on this site, of course) is current. 5. I reserve the right to use any of the ideas given. When people send me an idea that I use I try to send them an image file of the cartoon, but I sometimes forget. Closing date: 10pm UK time, Thursday 19 January 2017. I’ll post a list of winners the following day. If entries don’t appear straight away it is because comments by new commenters are moderated. Thanks in advance for all ideas given. Ideas sent to me via competitions like this or just via email at other times are always hugely appreciated and make it possible for me to keep this cartooning thing going. 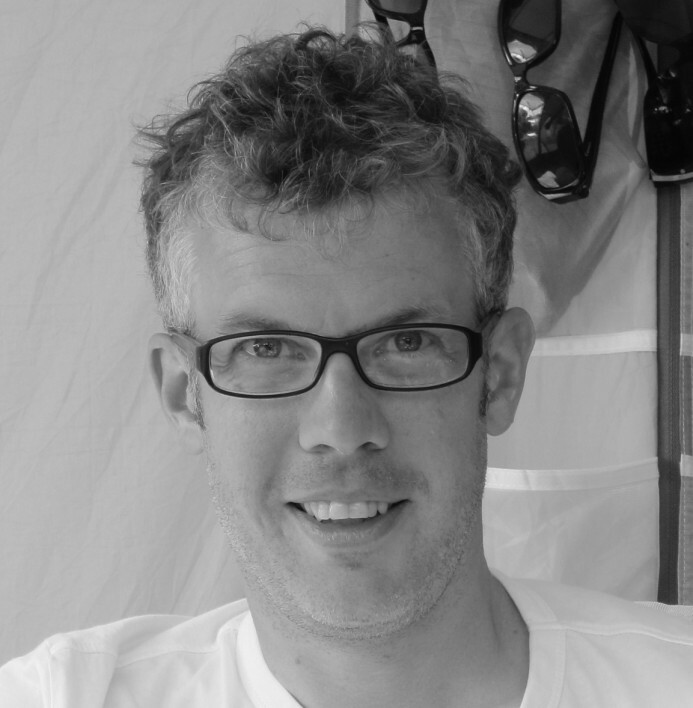 A huge thank you for all contributions. I will do another giveaway before too long. Subscribe to the blog, or follow on Twitter to be sure to hear about it. *In-depth technical note about my methodology. I use an online random number generator to choose the comment numbers, being sure to discard any results that are repeat posts so that each person has an equal chance. 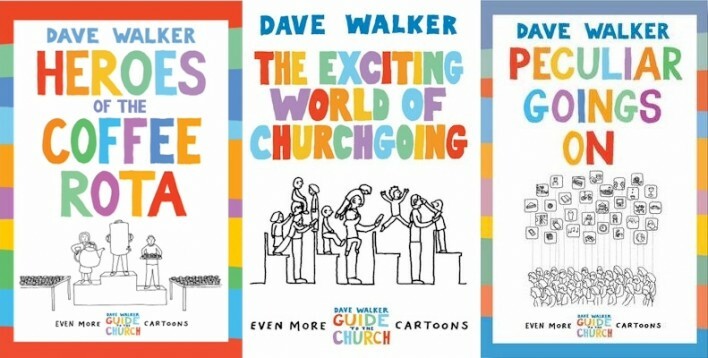 1) One copy of the Dave Walker 2016 calendar containing 12 of my best church-themed cartoons. This is still available from Church House Bookshop if you didn’t manage to get one, and if it hasn’t been reduced in price it will be reduced shortly [Update: £4.99, free UK postage today, Thursday 28th]. 2) Two prizes of one pre-production church cartoon mug. Mugs are still very available from Eve2 Media, but these are samples and at the time of writing the only ones of these designs to exist, and therefore unique. The cartoons are: Mug A, Ordination, Mug B, The best ways to escape. 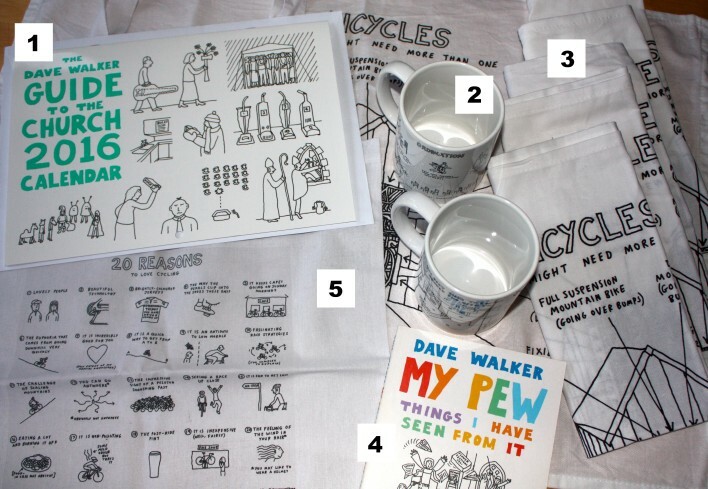 3) Six prizes of one cyclingcartoons.com ‘Bicycles – why you might need more than one‘ tea towel, but please note that these are slight seconds. By this I mean they have minor marks on them which meant I couldn’t sell them, but the marks really are not particularly noticeable. One or two might be printed over a small crease. You’d soon get marks like this anyway in the rough and tumble of the drying-up world. 5) One pre-production sample ‘20 reasons to love cycling‘ tote bag. The image is legible, but a bit smaller than is ideal, so perfect for those who don’t want anyone to read their tote bag. This is a unique item – these haven’t ever been produced. Plus… I may add a mystery prize or two. I haven’t decided what this/these is/are yet. Possibly just some junk lying around my office. But I’ll ask you first before sending a box of 25 defunct cables. Post either a cycling cartoon idea, a church cartoon idea, or any other cartoon idea in the comments below. (It must be on this site, not on social media). Ideas can be a topic you’d like me to cover, or something more finished with descriptions of pictures, etc. Ideas don’t have to be any good. If you have a prize preference please list the prize numbers in order of preference at the end of your comment, missing out any prizes you don’t want. For example, (3,4,5,2) if you love tea towels, but despise calendars. Entires must be made here and not on Facebook/Twitter. Reason: I use a random number generator to choose the winners, and that really only works if all answers are in the same place and not scattered here/there/everywhere. It is also difficult to print tweets out for reference. Prize-winners will be chosen at random from all entries given. I will contact you to ask for a postal address. I reserve the right to use any of the ideas given. When people send me an idea that I use I try to send them an image file of the cartoon, but I sometimes forget. Closing date: 10pm UK time, Thursday 28 January 2016. I’ll post a list of winners the following day. Thanks in advance for all ideas given. Ideas sent to me via competitions like this or just via email at other times are always appreciated and make it possible for me to keep this cartooning thing going. Any summer or indeed non-summer themed cartoon ideas would be welcomed. Anything you can send me via the comments section of this blog or via email would be much appreciated. Twitter is OK too, just not quite as easy for me to save / print off. Sorry to ask again, but cartooning has gone better than it currently is. I try to reply to all messages, but thanks in advance for your help. I’m open to requests for subjects for my weekly Church Times cartoon slot. OK, this is another way of saying I could really do with some ideas. Topics can be anything church-related, or some other issue (such as my election cartoon or the foodbanks one). I can’t make any promises to draw anything on the subjects suggested, but I print out everything suggested in these blog comments threads and carry it around with me. If possible I prefer ideas in blog comments (below) or by email. Tweets are appreciated, but they are harder to collect and save. So, here we are. It’s back to work time. For me this means thinking of some church-themed cartoon ideas. In order to start this process I thought I’d do a little giveaway in return for some diagram suggestions. I have two of my 2014 calendars to give away, and one copy of ‘Peculiar Goings On’, my newest (but now not especially new) book. There may be some other minor prizes made up of bric-a-brac from my desk, I don’t know. 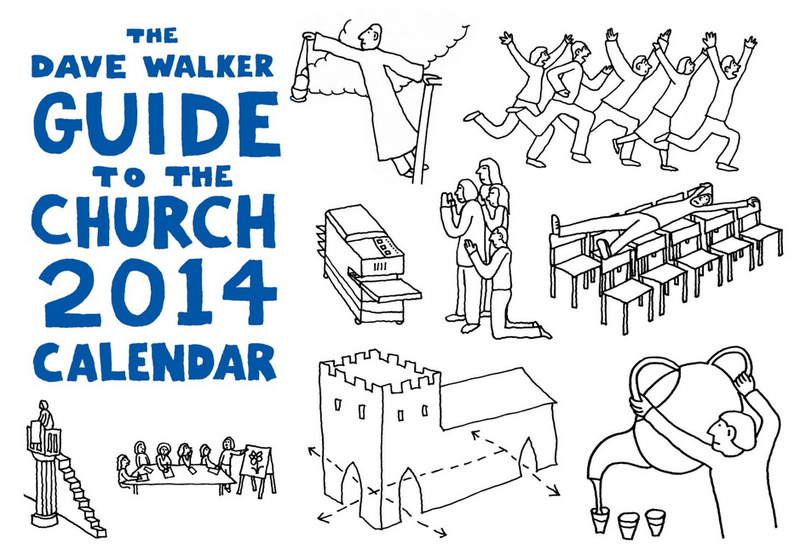 These calendars are not now available to buy anywhere, by the way. I will send prizes to three people, picked at random, who post one or more cartoon ideas in the comments below this post. You need to do so from now, Monday 6 January, until 10pm (UK time) on Tuesday 7 January 2014. The ideas don’t need to be brilliant or complete. It could be a topic you think I should tackle, or a entire idea that would work in my cartoon format. One idea is great, but more than one would be, well, marvellous. I’m very happy to sign the prizes. Entries may not show up straight away as I moderate first-time commenters, and I’m away from the computer during the daytime. Normally I welcome ideas sent to me by any means, but for the purposes of this giveaway they must be posted on this blog, not on Facebook, Twitter, or sent by email. This is the only way I can keep track of entries. Only one comment per person will be counted, so there’s no point in posting multiple times. The winners will be chosen by drawing small pieces of paper out of a saucepan (probably not non-stick). Please do enter even if you have a calendar – you could give it away. I reserve the right to change the rules. Many thanks in advance – ideas sent to me by people make it possible to continue doing what I do. 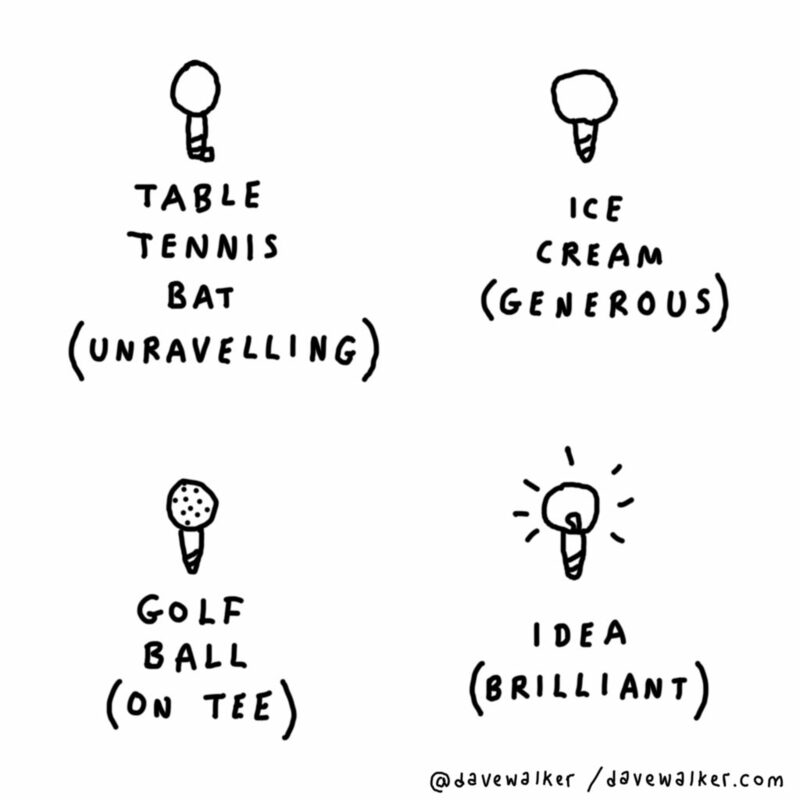 All content © Dave Walker. Copyright Policy. Powered by WordPress and the ace GeneratePress theme.